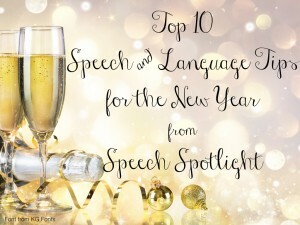 The SLPs here at Speech Spotlight thought it would be nice to reflect back on some of the best tricks and tips we use in therapy. Here are our top 10 tips to try in the New Year. Incorporate ideas and games from Occupational Therapists at the beginning of therapy is Ashley R’s suggestion. Jumping, carrying heavy objects, doing left brain/right brain exercises etc. help get children’s bodies “ready” and “organized” for therapy. For preschoolers who need to expand their utterances past one-two syllables/words, Lisette’s tip is to use “touch cues” when modeling. This works great for children with articulation or language difficulties. You touch/squeeze the child’s shoulder, arm and hand for each syllable/word as you say them. For example, if a child says, “Go play?” you would model with touch cues “Let’s go play.” It is an easy strategy for teachers and other staff members to use. For middle school students, Linda recommends using lots of video clips in therapy. It is particularly helpful for teaching social skills. For children with complex communication needs, Anne’s tip is to use songs especially ones that include actions. Children love the predictability and consistency of music. It allows all children to be successful. Children who are non-verbal are able to participate by doing the actions. Children who speak in short utterances are able to work on expanding their sentence length through singing. Anne wanted to share that in one of her classes there was minimal participation in August but by December everyone was participating! For children in kindergarten or grade one with articulation difficulties, Sarah suggests helping them sound out words. Beginning readers make lots of progress as they learn how to decode words. Start each session by asking children, “Why do you come to speech?” is Ashley B’s tip. Even young children can tell you their goals. It helps them understand why they are coming to speech and helps children focus on the upcoming session. For preschoolers, Jennifer suggests moving around during therapy. Games like “Mother May I?” or “Red Light, Green Light” are great games to use. The children are excited to work on their goals because that means it’s their turn in the game. For late elementary and middle school students, Susan recommends using Jeopardy-like games to boost engagement when working on semantic relationships. For children with complex communication needs, Collette suggests using photos of personally significant people during therapy. This makes it more engaging and can help children be more successful on a goal that may be tricky for them. Have the parents take the photos and send them to you. This saves you time and parents feel more involved, especially in settings with limited family contact, such as school. On behalf of all the SLPs here at Speech Spotlight we want to wish you a happy, healthy and successful new year. Absolutely love all of the tips! Thank you!